Researchers have been poring over not the front but the back of the Bayeux tapestry, to prove that it wasn’t woven by different teams of nuns in several separate pieces, but by the same group of people in one long length. After all, the back of a work of art says as much about its creator as the front. My Great Auntie Susie loved sewing, knitting and crochet of all kinds. But when I took her to the Victoria & Albert Museum to see the work of the great tapestry artist Kaffe Fassett, she had absolutely no interest at all in the beautiful artistry on display. ‘I want to see the sewings‘, she kept repeating crossly. ‘I don’t want to see the front. I want to see the back.’ Her measure of real craftsmanship was how beautifully Kaffe Fassett had finished off his threads at the back of the canvas. Several times, she tried to creep behind a display to peer at the neatness of the ‘sewings’ and each time we were warned not to get too close. Finally, she could bear it no longer; she grabbed one of the canvases and lifted it up to get a better look. We were politely asked to leave, but not before she proclaimed that, according to her standards, Fassett had done a good job. This is a dish in which all the sewings, the workings, the ingredients and the method are laid bare. There’s no concealment, no obfuscation, no trickery. It’s pure, simple, honest and above all delicious and every component can be seen clearly. And yet there is a mystery; the taste of the rice. It may look like perfectly standard basmati rice. But this is vintage basmati rice. Like Stradivari violins, the best harvests of basmati rice become finer over time. This particular Tilda vintage is from 2006 and the difference was apparent as soon as I buried my nose in the packet. It has a stronger, more toasted aroma and the flavour, when cooked, is both nutty and delicate. It seemed cruel to plonk something on top of it; hence my back to front rice salad that is both refreshing and refined and in which the rice is the star. I tried two different methods to cook the rice: first, soaking it in a bowl of cold water for half an hour before cooking it in a small amount of water with the lid on. My second method was to simply rinse the rice well and then simmer it very gently in an open pan. The second method produced a more distinct texture and better separated grains. 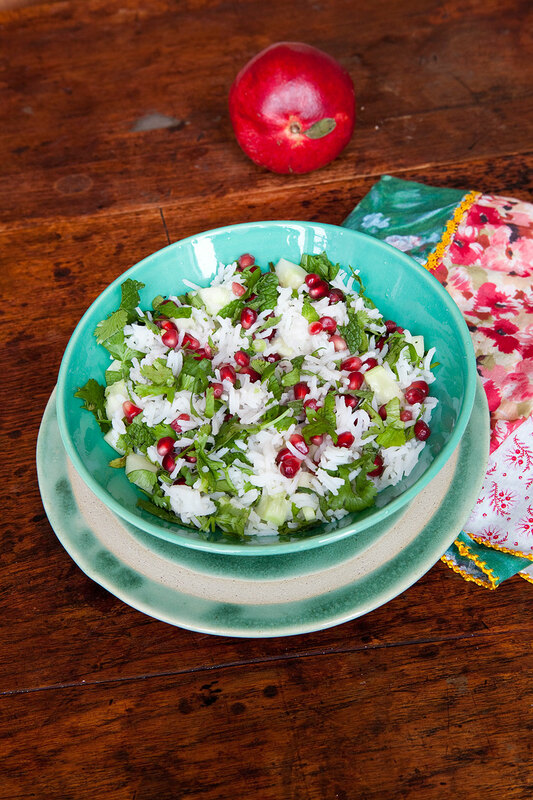 When the rice is cool, add the herbs, cucumber, spring onions and seeds. Mix the vinegar with the sugar and seasoning and then pour over the rice, stirring to coat it well. This salad, with its zingy, sharp dressing, is perfect with grilled salmon. It’s a dish that my Great Auntie Susie would have approved of, given that it reveals its ‘sewings’ so clearly and honestly. 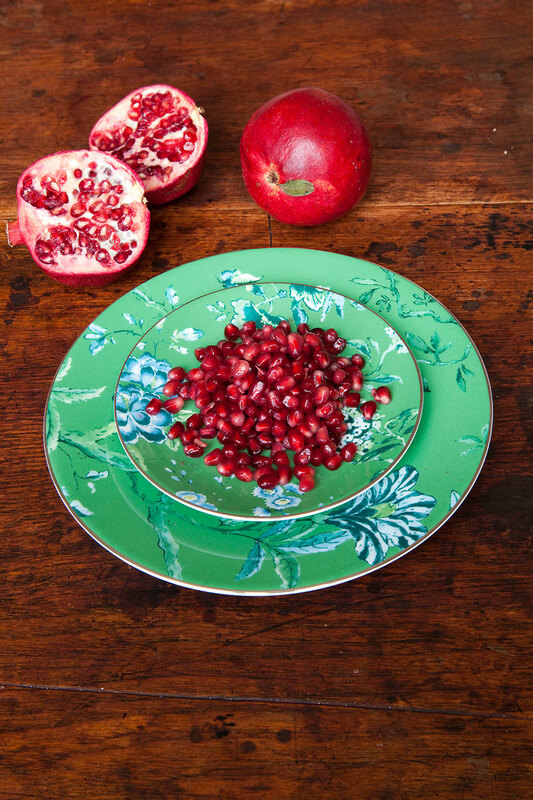 And she adored pomegranates. She would pull them apart and spear the seeds with a dressmaker’s pin from her sewing box. And so the post about the back to front salad that started with the stitching of the Bayeux tapestry comes full circle. It ends with a pin. I’m flattered, Boinsey – thank you, as ever, for leaving a comment. I always appreciate it. I’ve never heard of vintage basmati rice. I’m obviously missing something. Anyway what a wonderful confection – both culinary and literary. Thanks Jakey. I agree that vintage rice is a fascinating idea – the difference is quite noticeable. It’s more expensive, not surprisingly, but it’s worth it as a treat. You wrap the reader up in the fabric of your stories and tie them in with threads of many textures and colours. Great Aunt Susie would have approved. I share your appreciation of an orchestra tuning up. You’ve reminded me that we used to eat pomegranates with pins as children. I have no idea why. 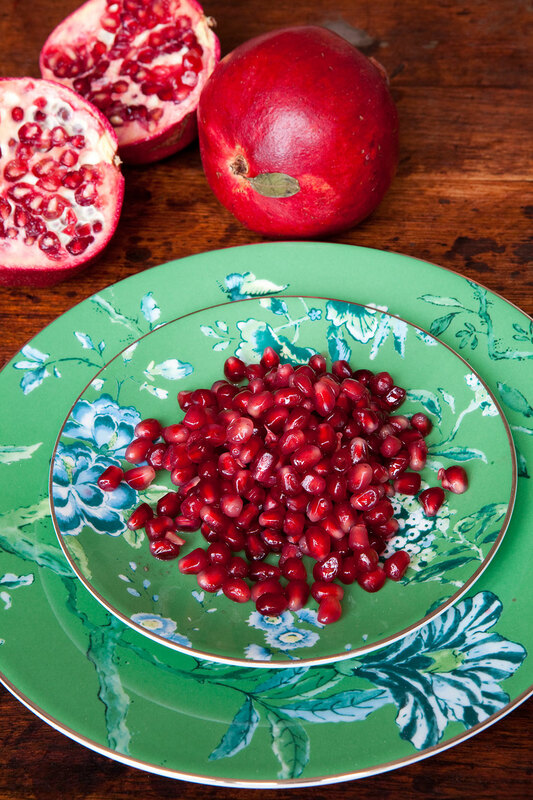 For years I thought that eating pomegranates with a pin was the only possible way to consume them. Like you, I have no idea why – it’s so much easier to pull them apart. Ha ha, upon my first read-through I thought “vintage” meant that you had found an old packet of rice dated 2006 in the cupboard. Lovely, fresh recipe. No, not an old hand-me-down, but real rice treasure! Good advice Jeanne – I wouldn’t be quite sure what I was looking for, but I love the idea all the same. Just had more vintage rice with a Spanish bean stew. It worked a treat. Charlie, I too enjoy hearing the orchestra tuning up before the concert and seeing the ‘sewings’ of a dish. The vintage rice was in the right hands with you. Too many cooks would have destroyed its subtleties with overcooking or, even more likely, overseasoning. Thank you Jean – I really appreciate your comment. And I’m glad to hear that you enjoy tuning up and sewings too. Yet another beautiful post and tempting recipe, Charlie! And I had the great good luck to see the Bayeux tapestry and I agree that looking closely at the stitches and imagining the nuns sitting and creating this magnificent masterpiece is part of the beauty and enjoyment. But, then again, I spent years making quilts and hats by hand, so the stitches and threads count for me as well. Your posts always make me think even before I arrive at the wonderful recipe! I didn’t know that you’re a quilt and hat maker Jamie. How wonderful. I’ve got some wonderful quilt fabrics from the V and A archive, but so far I haven’t done a single stitch. Yes, I did read your piece – and loved it. It’s wonderful to see a new print magazine swimming against the digital tide, isn’t it.